What’s the deal with Flax? You’ve probably heard of flax seeds by now. They’re popping up in ingredient labels on cereal, granola bars and breads. So why are food companies adding this seed to their product? What’s so great about Flax? 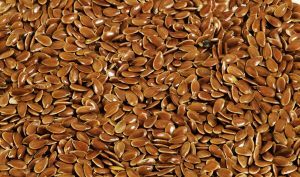 Heart Health: Flax seeds are rich in omega-3 fatty acids, specifically ALA (Alpha-linolenic Acid). Reducing Cancer Risk: They are rich in lignans. GI motility: They are also rich in dietary fiber. 60 calories, 4.5 grams fat (0.5 grams saturated fat), 4 grams carbohydrate, 4 grams fiber and 3 grams protein. Flax seed oil does not contain dietary fiber or lignans. Whole flax seed cannot be fully digested by our GI system, so it is preferable to consume it ground (called flax meal). Whole flax seed can be stored in room temperature for up to one year. Ground flax seed (flax meal) should be stored in an airtight container in the refrigerator. It’s best to buy whole flax seed and grind it as needed in a coffee grinder or mini food processor. Sprinkle flaxseed on cereal, oatmeal or yogurt. Top salads with ground flaxseed. Add to homemade baked goods. Replace eggs in baking. For 1 egg use 1 TB ground flax and 2-3 TB water. Whisk and let sit until thickened. This will not work for meringues or custard like preparations. Do you use flax seed? What’s your favorite way to consume it? Temperatures are dropping and as a result we’re turning to warm, comforting foods. Before you turn to foods loaded with cheese, pasta and high fat meats, you may want to think again. These traditional comfort foods are loaded with calories, fat and refined carbohydrates. Instead, why not try some soup?! Soup is warm, filling and quite comforting. Soup is so easy to make, and freezes incredibly well. I love using my immersion blender for pureed soups that seem creamy without any cream! (ie: butternut squash, parsnip, asparagus, and leek). 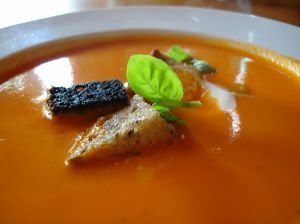 You’d be surprised how many vegetables puree up into a beautiful bowl of soup. You don’t need to follow a recipe; just sauté vegetables in a little olive oil (season with salt, pepper, herbs and spices) add low sodium vegetable or chicken broth. You can add in beans, whole wheat pasta, chicken, whatever you have in your fridge or pantry! Some of my favorite soups to make are lentil, butternut squash, vegetable, white bean and vegetarian chili. If it’s a mostly vegetable soup you will want to add some sort of protein to it. One of my favorite go to additions is a “healthy” grilled cheese. Take 2 slices of whole wheat bread and add 1 or 2 slices of low-fat cheese, place on a skillet coated with cooking spray and you have a delicious warm and filling lunch. If it’s a bean or chicken based soup then you most likely have enough protein. You can a side salad and some whole grain crackers for crunch. If you’re out to eat – pairing a cup of soup with a 1/2 sandwich is a great option too! Try this recipe tonight and I promise you will not be disappointed! It has 5 ingredients and is quick to make. My husband yummed throughout the meal and said “I would pay for this at a restaurant” – he’s a very tough critic so that meant a lot! 4- 4 ounce chicken breasts, thinly sliced (I buy the Murray’s thinly sliced one to minimize the work). Prepare 2 ounces of goat cheese in one small bowl, set aside. Finely chop the sun dried tomatoes, combine with goat cheese, set aside. Crack egg, and place egg white in a small bowl, set aside. Place breadcrumbs in a small dish, set aside. Place the chicken breasts on your working surface, sprinkle with salt and pepper. Add 1/4 of the tomato cheese mixture in the middle of each breast, then roll and secure with a toothpick (I didn’t have tooth picks so mine opened a bit). 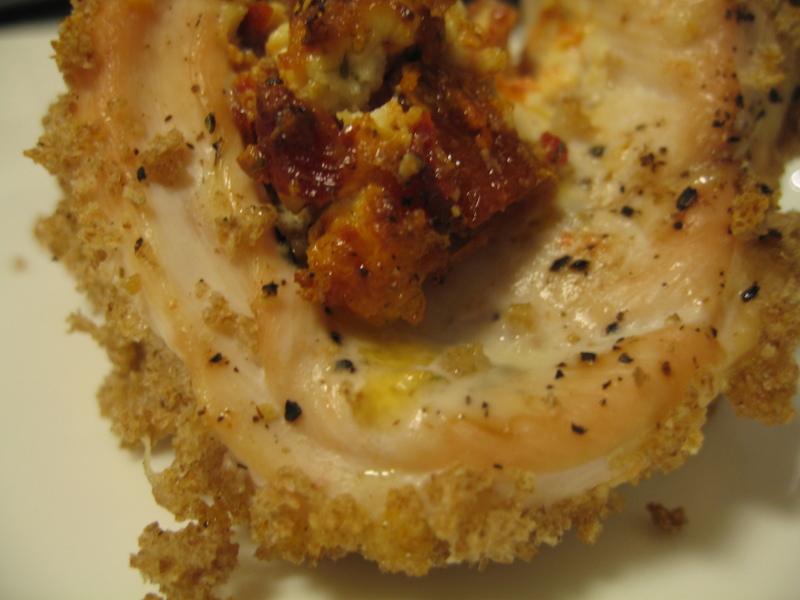 Dip each rolled chicken breast in egg whites and then breadcrumbs. 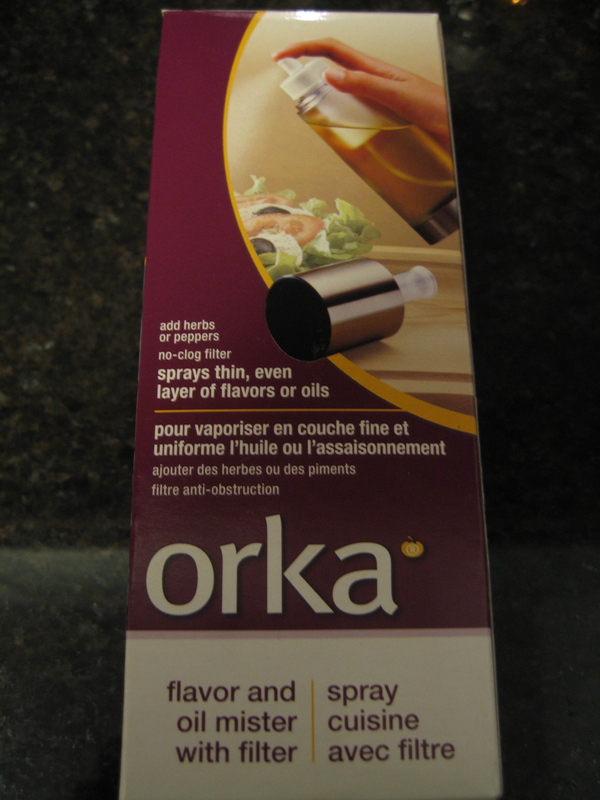 Place on dish prepared with cooking spray. Do not crowd the breasts, otherwise they will take longer to cook. Cook for approximately 20 minutes, check for doneness (oven temperatures and cooking times may vary). I served mine with a side of roasted sweet potatoes and roasted cauliflower – yum! The cacao tree is where chocolate comes from. The beans are made into chocolate liquor which is then processed into cocoa solids and cocoa butter. Pure, unsweetened chocolate is a combination of cocoa solids and cocoa butter. Sweetened chocolate has sugar added to it in varying percentages. Milk chocolate has sugar and milk added to it. White chocolate is not chocolate at all – but rather cocoa butter with milk and sugar. Why is chocolate considered healthy? The cocoa solids contain flavonoids which are a type of phytochemical. Flavonoids have been associated with reducing inflammation, blood clotting, and blood pressure as well as decreasing the risk of cardiovascular disease. Flavonoids act as an antioxidant which help combat free radical damage, which has been associated with detoxification of certain carcinogens. Antioxidants are found in many other foods besides chocolate – fruits, vegetables, legumes, grains, soy, coffee – and the list goes on. In my opinion, you shouldn’t be reaching for chocolate to get your antioxidants. In addition to the antioxidants you are getting saturated fat and sugar. Chocolate can be beneficial in small quantities if you choose high quality dark chocolate. 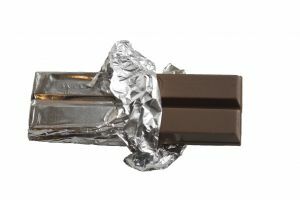 But remember milk chocolate contains very small quantities of the antioxidants and white chocolate contains none at all! This also doesn’t give you permission to eat large quantities of things like chocolate muffins, chocolate chip cookies, chocolate cake, and chocolate ice cream. These products will have small quantities of antioxidants (if any at all) and have a lot of saturated fat, sugar and calories. Some people have great restraint when it comes to portion control with chocolate, others have a hard time. If you find it hard to buy a large bar and savor it over several days, then I recommend buying individually wrapped pieces so you can control your portions! 1 ounce dark chocolate (70-85%): 168 calories, 12 grams fat (7 grams saturated fat), and 7 grams sugar. 1 ounce dark chocolate (60-69%): 162 calories, 11 grams fat (6 grams saturated fat), and 10 grams sugar. 1 ounce dark chocolate (45-59%): 152 claroies, 9 grams fat (5 grams saturated fat), 13 grams sugar. What’s your favorite type of chocolate? Do you buy it pre-portioned or can you limit yourself around large quantities? Personally, I like to keep the Ghirardelli Squares so I can limit myself to one square when I want a little chocolate fix. Have you struggled to achieve your “ideal body weight?” Where did you get this ideal number from in the first place? Was it something you last achieved when you were in high school or college? Is it a number you pulled out of thin air? Did you look at BMI chart to determine it? Did you pick it up from a magazine? Guess what? This number is different from everyone! It’s possible that 2 women who are the same size and same age have different healthy body weights! Forget the norms of the media, celebrities, and models. Start thinking about what is right for you! Stop dieting and start eating healthy. Incorporate more fresh fruits and vegetables into your day whenever you can. Choose lean proteins over higher fat ones. Add in whole grains, and limit your intake of white refined carbohydrates. Cook with heart healthy fats, and limit your intake of saturated and trans fat. If you eat this way the majority of time there’s room for your favorite indulgences in moderation. For me it’s pizza, pasta, cheese and chocolate and I never feel guilty when I eat them! If we all stopped dieting and tried to learn to eat in a healthy, balanced, moderate and varied way – we would achieve a weight that is healthy for us! Now here’s where it gets tricky! Are those last 5 pounds really worth it? Will I give up enjoying food to achieve those last few pounds? Am I healthy at my current weight? Will I feel deprived to get to that weight? Why am I trying to achieve that weight? Personally, I think food is a huge enjoyment in life and not worth sacrificing. Dieting leads to deprivation, which leads to an unhealthy relationship with food. Are you at a healthy, happy weight? Is it different than what you once thought was ideal for you? What are your favorite indulgences? Do you feel guilty when eating them?